U of R Awarded Tree Campus USA by The Arbor Day Foundation Seven years in a row! To reinforce and maintain an environment that preserves the beauty of the campus through a progressive program of grounds management, while supporting the study of native plant materials and developing new plant collections. The Arboretum will create an opportunity for continuing education about the University and regional horticulture, celebrating their history while promoting interest and support for the University and the Arboretum. The University of Rochester River Campus, located along the Genesee River in upstate New York, has a long tradition of using trees to enhance the beauty of this unique setting. Throughout the history of the University, founded in 1850, trees have been planted, maintained, and preserved. As further support of these efforts, in 1999, the president's planning group approved portions of the campus to be established as the University of Rochester Arboretum. The tradition is an extension of the arboricultural legacy of the Rochester area. Portions of the city and Mt. Hope Campus of the University still harbor remnants of the Ellwanger and Barry Nursery. The nursery trade that flourished in the late 1800s and early 1900s in Rochester was once the largest of its type in the country and has left a lasting impression on the city and campus. The River Campus occupies the original setting of the Oak Hill Country Club. The University purchased the Oak Hill grounds in 1923 and initially raised 10 million dollars for the establishment of the college on this site. Ground was broken for Lattimore Hall in 1927, the first University building to be constructed, located in the northwest corner of the Eastman Quadrangle. The integrity of the landscape was insured when Frederick Law Olmsted, Jr. was retained as designer and consultant to the architects. The Olmstead international fame stems from his father's design of such well-known areas as Central Park, the Arnold Arboretum, and Yosemite National Park. The University endorsed the River Campus in 1930 as the primary site of their men's college. Frederick Law Olmsted, Sr. was responsible for the design of a "River Walk" of oak trees along the Genesee River. This portion of the campus was recently sold to the City of Rochester, with contributions from Bausch & Lomb, to establish more public parkland along the river corridor. Included along a three-quarter-mile stretch are 197 oak trees with more than 15 different species identified between Elmwood Avenue and Intercampus Drive. Although not located on the River Campus, the University of Rochester also harbors a former champion Ponderosa Pine tree, which is among the largest known examples of this species in the State of New York. This giant, along with the canopy of cover from trees on the rest of the campus, add tremendously to the aesthetic appeal of the grounds while complementing and softening the existing architecture. The visual impact that trees have on the University grounds as they add fall color, winter texture, and spring flowers is invaluable. University Facilities sends notifications by email to those members of the University who wish to receive them. For directions to join this Listserve to receive email notifications, visit our notifications page. Winter walking falls often result in bruises, sprains, and broken bones. The departments of Environmental Health & Safety and Horticulture & Grounds have joined forces to provide tips on winter walking safety and posters you can print and post in your work area. Each year, the Horticulture and Grounds Management and their staff review the snow removal efforts of the previous year, and look to improve the level of service provided. One of the important measurements of our success is you, members of the University community. Given the weather in upstate New York, our mission is to limit the inconveniences that members of the University community have to face and to do everything within our means to make conditions as safe as possible by working to maintain adequate traction for pedestrians and vehicles properly equipped for winter conditions. Grounds Management and Staff are on call year round, 24 hours a day, seven days a week. In the winter, work schedules are adjusted to include an evening shift. The Grounds Management Staff review the weather on a regular basis throughout the year, with special attention during the winter season. They utilize a weather update information system through local meteorologists, regularly monitoring the National Weather Service and local radar which allows them to coordinate their staffing with the forecasted weather. Facilities snow removal staff are responsible for snow removal and/or salting at the Medical Center, the River Campus, the South Campus, Mt. Hope Properties, Memorial Art Gallery, Scottsville Parking lot and 300 Science Parkway. The roadways to provide emergency access and Handicapped Areas are serviced first. Parking and Grounds Staff are available to assist Handicapped individuals with special snow removal needs. Handicapped individuals should email John McIntyre or call him at 585-273-5815 to inform him of schedules so he can be sure that these areas are accessible. Sidewalks and roadways are plowed concurrently with the Parking Lots. Facilities snow removal equipment is generally removed from the parking lots during the period when staff are arriving and leaving the work place to limit equipment conflicts and to refocus on salting roadways, sidewalks, and building entrances. Parking lots are generally plowed minimally during the normal workday (i.e. 6 a.m. to 5 p.m.) during a snowfall. The majority of the University snow removal equipment is too large to maneuver down the laneways when the lots are occupied. Aggressively plowing while cars are parked in the lot may cause the plowed snow to be piled in front and in back of the vehicle. The University Grounds Team continually reviews and tests new products for both anti-icing and de-icing, looking to improve cost effectiveness and environmental impacts while improving results and efficiencies. When you are looking for a parking spot, be conscious of where the plow has and has not been. Be sure to park in areas that have already been cleared, allowing snow removal staff to continue to clear snow throughout the remainder of the lot. NEVER pull up behind a plow and wait. The “blind spot” on the plowing equipment is much greater than in a car and the plow operator may not see you if he needs to backup. 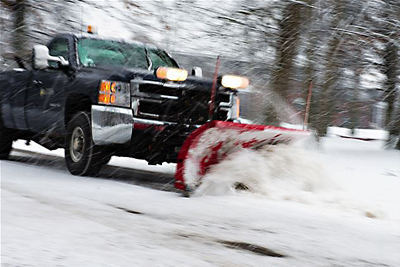 If you see a winter-related condition, call the Snow Removal Hotline at x5-0000 and report the condition. The first available snow removal team will be dispatched to address the problem. Quick Facts: Paved surfaces on River Campus, Medical Center and South Campus include in excess of 6 million square feet of pavement.